This walk: 2012-2-29. A walk led by Simon Dell MBE (Dartmoor Guide) on the slopes of Middle Staple Tor looking at granite working including the sett makers' bankers. 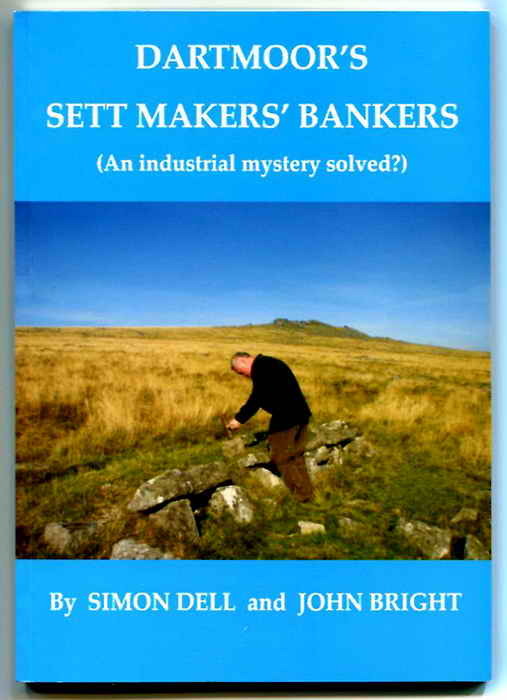 An introduction to sett maker's bankers, where stone workers knelt or crouched at these low benches, fashioning granite setts (cobble stones) that were used in making the streets of Plymouth, Tavistock and other places. This was an industry that flourished for about fifteen years from the 1870's, although some authorities state from 1850-1860. Setts can still be seen in many of the old back lanes of Tavistock and Plymouth. Double bankers at SX 54048 75292, where the men would have knelt with their knees against the low bench, with the stone chippings flying towards the rocks behind. The small chippings and shards of granite form piles that are often covered by English Stonecrop ..... but this is a nearby sphagnum moss! Nearby was a wet patch with some sphagnum moss (unidentified). Explaining that this area is the border between the granite and other surrounding "country rocks": according to the National Park "Geology and Landforms" fact sheet this is the area where the Carboniferous period granite meets Upper Devonian period slates and volcanics. As previous photo, or is it a dinosaur jaw?! Zoomed view through the mist to Vixen Tor. It might have been a convivial occupation in good weather? For shelter from bad weather, shelters known as "shakers" were sometimes built from stone that was to hand. The walls have collapsed in on two bankers inside the shelter. A pair of back-to-back bankers (SX 54065 75364) where a man could face either way depending on the weather, or maybe the sun? Feather and tare marks from where the rock has been split into smaller pieces prior to being cut again by lesser mortals who supported the sett makers. A single banker, where the left support has toppled? Another shelter or "shaker", possibly at SX 54068 75358 (there was a shaker at this location but we saw several and my records aren't perfect!). A large triangular rock, one of several that lead directly towards Little Mis Tor (seen on the sky line towards the right, in the mist. A banker where long kerb stones were made, SX 54189 75361. The top of the stone shows yellow lichen, a sign of alkaline conditions resulting from birds using the stone as a perch. Their droppings would change the naturally acidic conditions to more alkaline, encouraging different (and yellow) lichens. A large stone, split in one axis only, others have a number of splits. Looking up at Middle Staple Tor. View to Great Mis Tor, SX 562 769, elevation 538 metres (1765 feet) with Little Mis Tor at right (elevation 480 metres; 1574 feet). Middle Staple Tor, SX 5403 7564, elevation 431 metres (1414 feet). Group photograph, with a certain book being referred to again! My simple maximum zoom to a skylark! Another example of the border between granite and another rock. A mini cliiter from a sett maker. More evidence of sett making. A banker inside the shelter where the walls have fallen in. Yet another example of the boundary between granite and other rock. Pointer stone to Little Mis Tor. Zoomed view to King's Tor, SX 556 739, elevation 390 metres (1279 feet), with the rubble heaps ofSwelltor Quarries behind, at right. A single sett maker's banker complete with discarded chippings behind. Granite / quartz formation - phenocryst = a conspicuous crystal formation, generally indicative of slow cooling in the magma that forms this igneous rock. As previous photo. This also looks like a pegmatite quote: ... "a very coarse grained igneous rock that usually occurs in dikes (seams of rock that cut across the main country rock) or lenses (pods of coarse-grained igneous rock included in other rocks). Pegmatites can be from a few inches to hundreds of feet thick. What makes many people interested in pegmatites is the fact that many exotic and important minerals, including many gemstones, are found in them." Staple Tor has at least one dike running across the north side and it's described as a dike of quartz porphyry. A hand sample looks like two granite clasts, one fine grained and the other coarse grained, stuck together. Thanks to John & Elaine, my geological consultants for some of this information. Large quartz crystals, one component of granite. Great Staple Tor seen from Middle Staple Tor. Looking down on a pointer stone with the car park near Merrivale stone rows in the background. Two wheel ruts "in a loading bay" from when the carters loaded the two-wheeled carts with the setts. Plaque in the car park mentioning the Rees Jeffreys Road Fund - this links to their web site! See also the "About" link that is about William Rees Jeffreys, the man, who was responsible for roads being classified as "A" & "B" roads. MAP: Blue = projected route, Red = GPS satellite track of the walk. This walk was accessed by parking at the Rees Jeffreys car park marked on the map by the yellow cross. This is about 1 km west of Merrivale on the Two Bridges-Tavistock road.